The 'approved' person via Random.org is... Comment #5 - Congratulations PMJ! Enjoy the latest Suze Orman book! I hope you find some valuable tips!! Hard to believe but the first quarter of 2011 is almost coming to a close! Last summer Suze Orman launched an online community http://www.moneymindedmoms.com/, a site devoted to helping moms make smarter money choices. Suze has revamped the site and partnered with a team of MoneyMindedMoms bloggers, some of whom you may recognize, to bring you more perspectives on money-related topics. MoneyMindedMoms community members have free access to valuable, easy to follow advice about topics such as erasing and managing debt, raising money minded kids and coupons and discounts. Providing sound advice is Suze’s top priority and she takes the time to personally respond to questions from members. The site offers useful tools like a debt eliminator and expense tracker, a coupon savings center, as well as forums for sharing stories and insights with like-minded moms. I recently received a copy of Suze's book - ACTION PLAN - (New Rules for New Times) from MoneyMindedMoms through MyBlogSpark. So much has changed on the financial landscape that it’s hard to know which moves are the right ones to make. Suze Orman’s million-copy bestselling financial action plan—fully revised and updated for 2010 and beyond—will show you the way. ***Are you on the road to financial freedom? How are you getting your finances in order this year? 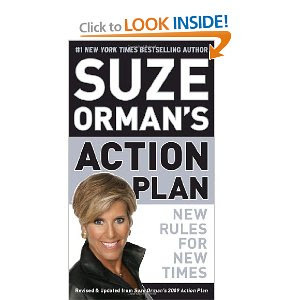 Leave a comment here and be entered to win your own copy of Suze's book ACTION PLAN!